The Green Zone 2.8 liter vacuum storage container by Freshield is the perfect cake storage container. The Green Zone vacuum sealed food container will keep cakes fresh for over 2 weeks at room temperature. It is also freezer safe and will keep your anniversary cake fresh frozen for a full year if properly prepared. We have a special price on this storage container with manual pump. The Green Zone 2.8 Liter cake storage container by Freshield $26.98 Includes a manual vacuum pump and shipping! Learn how to store cakes with our step-by-step instructions; whether storing cake for next week or preparing the top section of your wedding cake for your first year anniversary. The process for successful cake or food storage is to remove the air from the storage container. The growth of mold and bacteria is slowed tremendously in a vacuum environment. 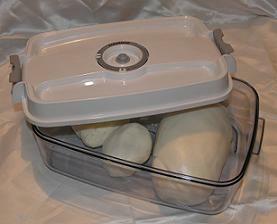 The sealed vacuum container keeps food fresh up to 5 times longer than conventional storage methods. Additionally, there is a date indicator to lets you know when you prepared it. There is a fantastic web site called Food-Storage-Info.Com that has lots of ideas about cake storage as well great information concerning safe food storage. I visit the site often to learn more myself. We also have a special offer on the Genisys vacuum container that's great for storing fondant. $29.63 Includes a manual vacuum pump and shipping! The Genisys vacuum storage containers are non-staining, impact proof, silicon sealed, microwave, dishwasher and freezer safe. 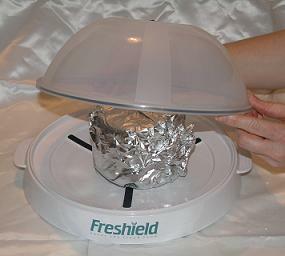 E-Mail Steph a question about the Freshield cake storage containers? Use the containers to vacuum seal and store delicate foods that are easily crushed, like cereals, chips, snacks, cookies and crackers. The Genisys vacuum sealed storage containers use a manual vacuum pump to remove the air out of the specially designed vacuum sealed containers. Our secure billing service accepts all forms of payment including all major credit cards, checks, debit cards, PayPal and others. As always, if you are not satisfied for any reason whatsoever, simply return within 90 days for a full and unquestioned refund. Thank you for your continued business and we know you will love Freshield!